Our esteemed Editor has begged me to write another episode, in the saga, even if I just take something apart and put it together again. Well to quell his anxiety and to possibly solve an annoying engine vibration, I removed the head and the side covers, to check combustion and the cam followers. CURSE HIM. 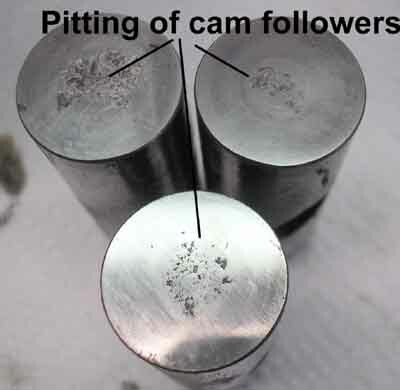 The head turned out to be warped, requiring machining to correct and the cam followers were starting to chew out. 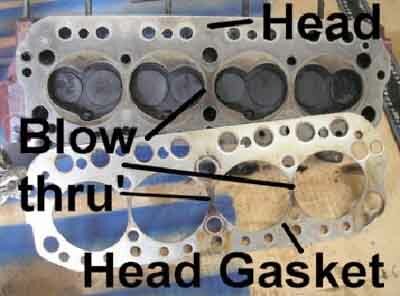 This photo shows where the head was warped, the dark smudges are carbon deposits, from the "blow through", between cylinders. Also revealed is the fact that there has been some oil leaking out from under the head, again due to the warp. After removing the head, the valves had to come out, so that the head could be sent off for machining. Valves are a pain to remove. 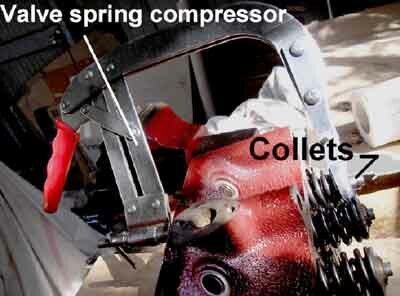 One has to compress the spring(s) to be able to remove the tapered retaining collets. The valve compressor has to have some force on it, then the cap, on top of the spring, needs to be whacked with a rubber mallet, to loosen the collets, then the spring needs to be compressed more, to allow the collets to be removed. Unless you’ve been keeping up with your chest expansion exercises, this is difficult. When the head came back, the face of it was nice and shiny, and, hopefully, truly flat. Next, I removed the side covers and the cam followers, which upon inspection, showed that they had had it. They showed signs of pitting. Conventional wisdom is that the cam should also be replaced, but inspection didn’t show any damage, so I’ve taken a punt and left it. Time, enthusiasm and cash are a bit short at the moment. Anyway, I contacted Greg, at Concourse Spares, who, unfortunately, only had 5 in stock. I needed 8. Wound up ordering them from MG Spares in Sydney, and spent the next week rushing to the letterbox, every half hour, looking for them. Well they eventually arrived and I could put everything back together, surprisingly without any traumas. Whilst I was in there I revisited my run on problem, which I wrote about sometime ago. The fix I described, using a small vacuum valve, worked great, for a short time, then back to running on. I tried, then, to improve matters, by increasing the vacuum that I hit the overflow ports with, without any success. This time I reduced the vacuum, figuring that, with high vacuum, it could be sucking petrol out of the overflow and into the manifold, thus providing fuel via a different route. (The idea was to put a bit of suction on the overflows to pull fuel out of the jets, thus "starving" the engine). To increase vacuum, at the overflow ports, I had inserted a restrictor, in the downward side of the overflow tube, which I now removed. Early indications are that this might work. Anyway, the engine is back together and running, requiring a final tune up, once everything has had a chance to bed in. The peaky vibration I had is gone, but I’m still not sure if the head and cam followers were all the issues, may still be something in the flywheel, clutch area.